If you’ve been paying attention to Saving Country Music, then you should already know that the name Logan Ledger is one you should be paying attention to. But up to this point, whatever potential this burgeoning performer had was all hypothetical. Now that has all changed. There will be much more on Logan Ledger in the coming days and weeks, but rest assured it’s a name you will be hearing often after getting a load of his voice and style. 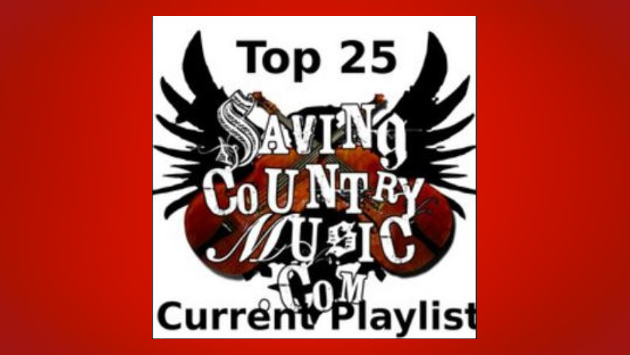 His first official piece of widely-released recorded music called “Starlight” leads the newest additions of the Saving Country Music Top 25 playlist. Joining Logan Ledger on the playlist is the much more established Hayes Carll, whose new album What It Is makes a case for itself as one of the best so far in 2019, and his song “If I May Be So Bold” makes the list. Few are more established in country music than Reba McEntire, and she promised her most country record of her career with her upcoming album Stronger Than The Truth, and so far she has delivered and then some, first with the Western Swing-styled “No U In Oklahoma,” and now the heartbreaking “Tammy Wynette Kind of Pain” that makes the playlist. Part of the fun of the playlist is discovering something new, and the new single from Gethen Jenkins called “Restless Ways” gives a good introduction to this Outlaw-style singer and songwriter if you need one. The Shootouts bring the classic country twang hard and heavy in the song “If I Could” off their album Quick Draw, which will be out in May. And if you like the more thoughtful, songwriter-driven approach to country indicative of acts like Jason Isbell, Austin Lucas, etc., you’re going to want to be on the lookout for Nathan Seeckts whose new album The Heart of the City is out at the end of March. His new song “Old Blood” also makes the playlist. Please Note: The songs on this playlist are curated for listening pleasure and flow. Otherwise, they are not in any specific order. In not so good stuff, I see that the latest abomination that Nashville is forcing upon us, King Calaway, has finally released a song. I look forward to your review, Trig. New songs, new artists, classic & traditional country, country-pop, Texas & Australian tracks, a new playlist…but still no Spotify. Feel free to use my playlist to create a Spotify-list. All artists & songs should be on YouTube or Google Play, Amazon Music, Spotify & other streaming platforms. Has Jason Cassidy come back to Earth? I first heard him with “What If,” which is still one of my favorite songs, but I didn’t much care for that album or the next few after that. Has he picked a lane? The single is middle-of-the-road. His last songs did well on the Texas Top 100. I don’t think he will change the formula for the next album. I probably will be reviewing the new Justin Moore album. I expect it to be pretty traditional. “Jesus and Jack Daniels” is not a bad song, just one that’s been done many times and many different ways. I’m sure I’ll have more to say about the release in the coming month or so. Just listened to the 2 Logan Ledger songs………..Love em!! THAT’S Country music!!! I like that you added “single” and release dates. I love discoving new music and artists through your playlist! Good call in September with LL. Dude’s legit. I’m going to comment on radio, and country radio in particular. Radio programmers are the ones who choose what to put on their stations and the number of times the particular song is played. It seems like that even with research it still comes to the whims of the programmers. It means that the volume of play time for a particular song doesn’t have to equal the song’s actual popularity, never mind quality. That’s my opinion. This Logan Ledger stuff is straight down my alley. Wonderful production. I don’t know what reverb they’re using but it is tasty. I saw this kid open for Ashley McBride a while back. His name was Dee White. I was extremely impressed and he really put on an interesting and entertaining set. His album just came out. Wow, something cool and different. Trig, I don’t know if he is on your radar. He was produced by Dam Auerbach and Ashley McBride is on one of the tracks. Thanks for the heads-up! I am sampling his album now on apple music. That duet with McBryde is serious countrypolitan! I am liking what I have heard so far, from a couple of tracks. FWIW, I’m loving the new eponymous Patty Griffin album. You might (or might not) want to add a cut from it. It’s great to have new music from her after she spent the last couple of years (successfully) battling breast cancer. That Shootouts tune is almost there. Maybe turn down the pedal steel, add some snaps/claps, and insert a rap verse. Then maybe you’ll have something. It’s just too darn country, as it is right now. I’m digging the Tanya Tucker-esque vocals from Reverie Lane. I hope we get more music from them soon. As always, this playlist is great. Thanks for sharing it on Apple Music, too, as that’s my platform of choice.